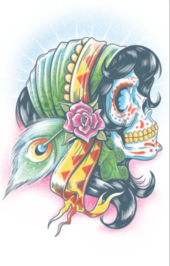 This colourful Lady Gitanos temporary transfer tattoo will finish your Dia de los Muertos costume perfectly. Applies with water and removes with oil. tattoo measures cm wide, 12cm long.